Any couple will look sweet upon the seats of this endearing illustration of a bicycle built for two. When a regular fixie simply won't do, you and your other half will look sweet upon the seats of this bicycle built for both of you—there's even a place for your pup, too! Riding through a spring-like background, a colorful duo by Patricia Carlin are custom designed to look like you and your sweetie or your favorite couple riding along on a tandem bike. Choose hair and skin color to match your pedaling pair even your family pet can defy four-legged logic and join you for a ride in the park. Designed in Pennsylvania by Patrica Carlin. Printed and framed in Oregon. Ready to hang (wire hanger). Mounted on an FSC-certified and conservation quality matboard. The hand-assembled frame consists of durian wood. This wood comes from a Malaysian tree whose lumber is harvested after it can no longer bear fruit. New trees are replanted in fruit orchards to replace the ones cut. Click to view the full menu of character and color options. 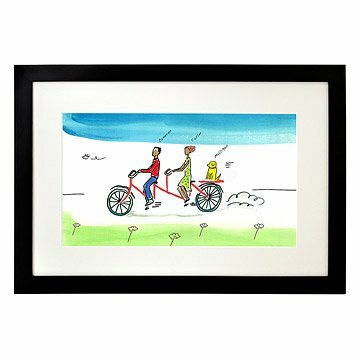 For a family version, check out our Personalized Family Tandem Bike Art. For more family scenes, check out our Personalized Family Canoe Art and Personalized Family Ski Art. Comes ready to hang in black wooden frame with Plexiglass. This is a made-to-order item. You will receive a proof within 1-2 business days from our custom order team. At that time, you can request a revision or approve the proof. You will be provided with a ship date for the final item after approving the proof. If we do not receive a response within 1 week, your proof will automatically get approved and your order will be put into production. This item typically ships 1 weeks after proof approval.At this time, this item cannot be shipped to P.O. Boxes or to APO/FPO or US Territories. Contact custom@uncommongoods.com with any questions. What the what!!!???? Thank you so much!! ... We love it! They loved it immediately and displayed it right away. It was excellent quality. Just as I had ordered it. I loved the nice framing and matting. It was beautiful and they loved it. Adorable. Memory for a lifetime. So unique and well appreciated! 1st class quality! I love this picture, not only is it great quality and a one of a kind but also super funny! I bought this for my step-dad's birthday and he loved it! This was the perfect gift for my son and his girlfriend. It is a unique, playful, high quality picture. It is a great value for the price. Can't wait to give it to the bride and groom! It looks great! Very fun piece of art! I gave this as a gift to a couple who not only love tandem biking, but she put him thru graduate school and he recently graduated -- a beautiful "tandem" effort I enjoyed honouring. Absolutly the best gift ever! My Grandson & his wife were truly surprised and loved the picture. It was a "hit" with everyone who saw the painting. I bought this for my brother and his wife as a Christmas gift. The final product was lovely and they both seemed very pleased. I especially liked that I could choose different skin tones. On some of the other personalized products that Uncommon Goods offers both skin tones have to be the same, which doesn't work in our family.